22 Michaels: How can my website take payments from overseas? The following post was cross posted on Startup Smart. I want to encourage online orders from overseas and am considering taking payments in other currencies. Is it possible to do this and, if so, how much time and money does it take? Is it a worthwhile thing to be doing in the first place? This is a great question and an issue we faced early on in the development of Shoes of Prey. Is accepting multiple currencies worthwhile doing? There’s definitely an advantage in being able to accept payments in multiple currencies if you’re looking to sell your product overseas.. Put yourself in a potential customer’s shoes. If you were shopping from Australia on a website that only offered payment in a non-major currency like Canadian dollars or South African rand would you be as likely to purchase as if the retailer offered payments to be made in Australian dollars? Probably not. Offering payment in a customer’s local currency makes it immediately obvious that your website can sell and ship to people in the customer’s country, so it’s going to help improve the conversion rate on your website. An alternative is to list pricing in a customer’s local currency, but then charge their credit card in Australian dollars. The problem with doing this is that the customer will likely be charged international exchange fees by their local credit card provider which they may not like. The local Australian unique jewellery retailer Oye Modern take this approach and charge overseas customer’s 2% less than the Australian dollar price so once the credit card fees are added customer’s aren’t out of pocket. This approach is a good one but if you can accept payments in the customer’s currency that’s going to be better. 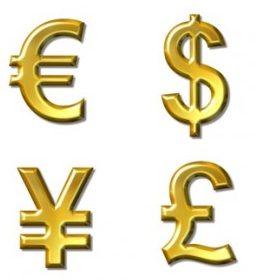 Is it possible to accept multiple currencies on your website? It is. The simplest place to start is with PayPal. From very early on in the life of Shoes of Prey we’ve offered the ability to pay in 7 currencies on our website using PayPal. We match a customer’s IP address to their country and only show them pricing in their local currency. So US customer’s see pricing in US$ by default, European customers see Euros and Japanese customers see Yen, and when any of them make a purchase from our website we charge their credit card in their local currency. The main disadvantage of using PayPal is that their Website Payments Pro product is not yet available in Australia. This means you’ll need to direct customer’s to the PayPal website to enter their credit card details, so you can’t create a single page checkout on your website, which would probably convert a little better. PayPal plan to launch Website Payments Pro in Australia in Q2 2011. The other disadvantage of PayPal is that you’re forced to convert your foreign currency sales to Australian dollars through PayPal and they charge a 2.5% spread for this, on top of their 3.4% plus $0.30 per transaction fee for new businesses. While the final price of 5.9% isn’t cheap, we use them because in our view it’s the best option on the market. The only bank in Australia that offers a multi-currency merchant facility is the NAB, but unfortunately their product is not at all easy to apply for nor use. We initially applied for a NAB multi-currency facility but after a 2 month application process which included submitting business plans and having to put together a spreadsheet to attempt to understand their fee structure (there are more than 10 different fees involved) we gave up and decided to go with PayPal. The NAB product is also difficult to use. They don’t have a web based platform to access your money so you need to install their 10 year old software on your computer, which of course they charge you for the privilege of using. You also need to sign up separately with a payment gateway provider and manage fraud and other risk issues yourself. PayPal incorporate the payment gateway into their platform and take care of the risk management for you. We’re of the view that it’s an important service to offer customer’s the ability to pay in their local currency, and we think PayPal have the best product on the market in Australia for doing this. Foreign currency sales make up 50% of our total sales at Shoes of Prey so selling overseas has and will continue to be an important part of our growth.